I found this litho while crawling on my hands and knees through the supply closet of a deceased art teacher. 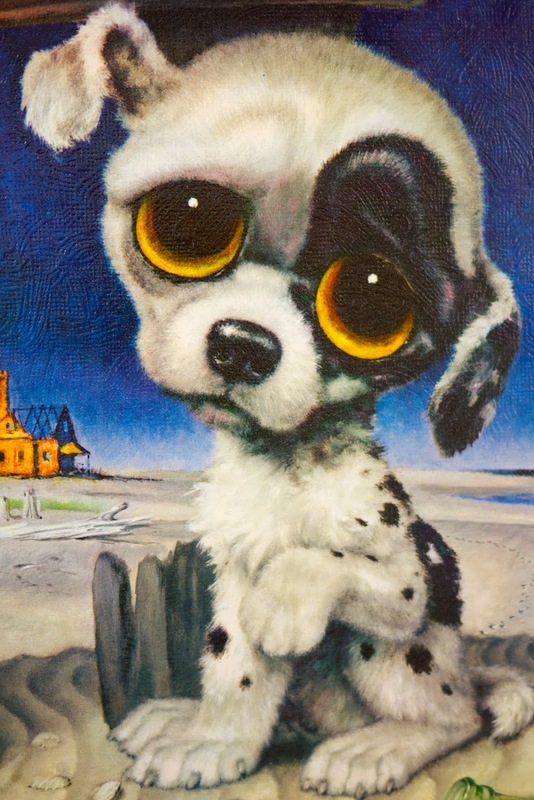 I did not shell out a dollar for it because I'm a fan of the creepy-campy 1960s school of saucer-eyed sad art, popularized by Margaret Keane, and a bunch of mono-named artists like Igor and Gig. I bought it because this "Pity Puppy," named Potato Chip, greatly resembles my own Pity Puppy, named Cupcake. I mean, am I right? Cupcake may not have saucer eyes but that sad-sack demeanor is unmistakable. I don't know anything about the artist Gig, to whom this puppy portrait is attributed. With the exception of Margaret and Walter Keane, who started the whole genre, these purveyors of mopey creatures—precursors to the Littlest Pet Shop critters, for sure—seem to be a shadowy lot. The story of the Keanes is pretty fascinating, though. Apparently when they were married back in the ’50s, Margaret allegedly did all of the painting while Walter got all the credit (he compared himself to Rembrandt and El Greco). After an acrimonious divorce, Margaret eventually sued him in the mid-’80s, challenging him to a paint-off in court. She produced a waif for the jury in less than an hour, while Walter claimed to have a shoulder injury. The jury awarded her some $4 million. And according to The Hollywood Reporter, Tim Burton is making "Big Eyes," a movie about the Keanes starting Reese Witherspoon and Ryan Reynolds. What—no Johnny Depp? ?